Denture wearers are often unsatisfied with the fit and performance of their dentures. While they can restore the appearance of your smile, they will never feel quite like your natural teeth. Worse still, poor retention and the need to use denture adhesives can lead to difficulty talking or eating, thus eroding self-confidence and self-esteem. 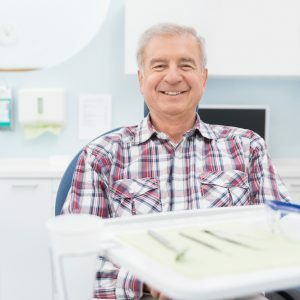 At Lightfoot Center for Laser Periodontics in Hingham, MA, dental implants placed by our specially-trained doctors, help you feel confident that your dentures will be securely held in place. Dental implants are titanium “posts” that are implanted into the jaw bone. These posts integrate with the bone over time, creating a firm foundation. Dentures can then be attached to this foundation, in an effort to increase stability, using two methods: bar-retained implant supported dentures and ball-retained or precision attachment-retained implant supported dentures. Bar-retained dentures supported by dental implants alleviate some of the irritation caused by the rubbing of dentures against your gums. When your doctor performs this method at his Hingham, MA office, dental implants are placed in the jaw bone strategically, using three or more titanium posts. A metal bar is then attached to the posts of the dental implants and will accommodate your dentures. Your dentures rest on the bar and are held in place with metal clasps, resulting in more stability while retaining the ability to remove the dentures for cleaning. Ball-retained dentures supported by dental implants, similar to the bar-retained method, require the placement of implants. However, instead of attaching a metal bar to the dental implants, each post of the dental implants are topped with a ball. Your dentures are fitted with corresponding sockets that will lock into place when lined up with the dental implants, creating a stable, firm hold. If the instability of your dentures is causing you to lose interest and enjoyment in everyday activities, contact our office to learn more about how you can benefit from dental implant therapy.